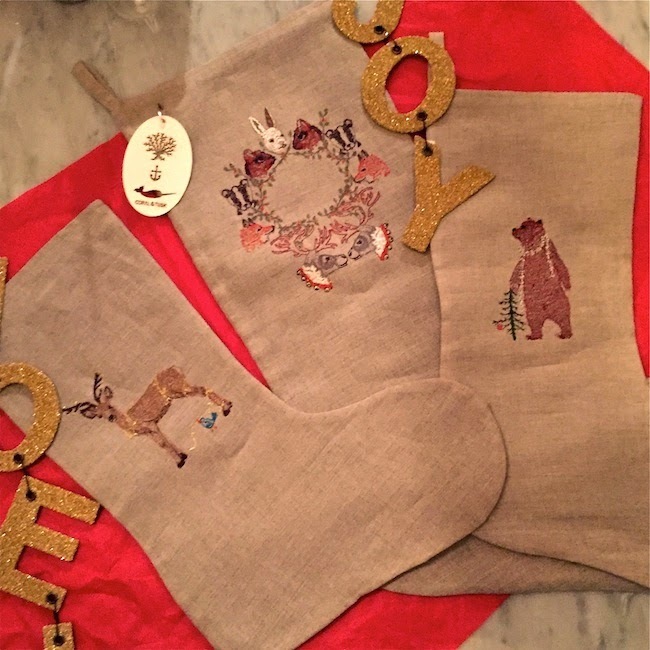 Looking for Christmas stockings? I've been hunting online for something unique and kind of gave up. Everything I saw was very ornate, glitzy, furry or too generic. But I stumbled upon my perfect ones today! Guess where? Of all places - In Grand Central Terminal train station at the store Cursive! I almost missed my train because I got distracted by these stockings in the store window! Different? These stockings are made by a Brooklyn based company Coral and Tusk. They're embroidered linen stockings. Even though its machine embroidered it still looks delicate. I was mostly drawn to the tasteful motifs that aren't overly cutesy or fussy, and love the clean look of linen. Plus they're affordable. Under $100! These are some other stocking designs available. Check out Coral and Tusk online shopping website and browse their lookbook. Their home accessories are modern, and simplistic with a rustic charm. Especially cute pillows, quilts, framed embroidery artwork for kids rooms. Not forgetting to mention their Teepee's. Did you see them in the lookbook? Go and look. This Brooklyn team really has good stuff!